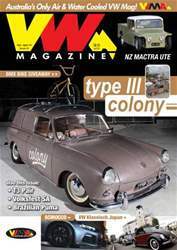 (1 Customer Reviews) | Write Review 4 issues per year VW Magazine is an Australian owned and published enthusiasts magazine serving both the aircooled and watercooled Volkswagen scene nationally. Published quarterly (Feb, May, Aug, Nov), the magazine covers every aspect of the hobby, from the very early models through to the latest innovations, motorsport, offroad, kit, custom, books, toys and shows. If it doesn't appear in VWMA then it isn't VW related. Now in its seventh year, VWMA also hosts two drag racing weekends, sponsors a variety of VW shows, and supports events across the country. VWMA is also fortunate to have access to a talented pool of home based VW photojournalists and print/web technicians, who work with VWMA to produce quality VW entertainment each issue. Download VW Magazine today to never miss an issue. The current issue of VW Magazine Australia (Issue#41 Feb-April 2014) explores the Type III addiction of Clint Millar and his impressive fleet, including his latest acquisition a rare 1965 Type III Panel van. Also unique is the 1961 Mactra, a NZ coachbuilt farm ute that has been transformed into a drag truck by Tom Gotta and Andreas Zickert. The ute was found abandoned on a NZ farm, rescued by the boys and brought back to Germany for the drag truck treatment. This issue also has coverage of the Victorian and Western Australian Day Of The Volkswagen shows, Volksfest in South Australia, a beautiful pair of T3 models owned by Phill Lander, a look at the history of the Brazilian Puma and a sweet '61 Beetle for the track and street. VW Magazine is an Australian owned and published enthusiasts magazine serving both the aircooled and watercooled Volkswagen scene nationally. Published quarterly (Feb, May, Aug, Nov), the magazine covers every aspect of the hobby, from the very early models through to the latest innovations, motorsport, offroad, kit, custom, books, toys and shows. If it doesn't appear in VWMA then it isn't VW related. You'll receive 4 issues during a 1 year VW Magazine Australia magazine subscription. Great Mag for VW camper Owners more ideas for those with a thirst for more adventure. You'll receive 4 issues during a 1 year VW Magazine Australia magazine print subscription.